I have been traveling around the country for decades and I have to say this is the most disgusting place I have ever walked in. The room was disgustingly dirty the place was falling apart. It smelled disgusting in the halls and the room. The blanket was torn the sheets were dirty the mattress was disgustingly stained. We were in Orlando for a show so we carefully changed our clothes for the show in our room and checked out. We were not alone we were there with another couple who had a separate room in the same condition. The woman in the other couple was in tears thinking she would have to sleep there because we came in my car but there was no way we would stay there or suggest anything other than leaving that cesspool. Do not go to this place, No way NO how under any circumstances. Can't believe the Heath Department for the State of Florida or the City of Orlando let's this place stay open. Absolutely disgusting! The entire hotel needs a good cleaning and fresh paint. The bathroom in our room was old and gross; cracked and dirty tiles, stains on mirror, etc.. I would not even shower in it. The carpeting was old and stained. The furniture was dirty. for the condition the hotel & our room was in, this MOTEL should not be charging people more than $30 a night IF THAT!. I HAD TO CHANGE ROOMS because the first one had a shower drip and there was mold in the bathroom. when i left the Room to change it, the front desk lady asked if i moved or touched anything so they wouldn't have to go back to clean the room...which didn't look clean to begin with. only Pro's i can give this place is the location. its Ideal, super close to DT Orlando & Lake Eola like 10-15Min walking/ driving 3 Min. other then that dont waste your money, there are cheaper and nicer hotels. I was very disappointed with this hoel. When you walked in it smelled moldy. The carpet in the hallway to the rooms were full of stains. The room looked ok but when you went into the bathroom, there was hair on the floor and the shower tile grout and caulking was moldy. This place needs a remodel. This place is gross. When I was checking in a customer was at the front counter complaining about the condition of the room. I can see why. Our room reeked of marijuana even though we were in a non-smoking room. The carpets were nasty and extremely dirty. The next morning at check out there were two police cars parked downstairs at the front which is un-nerving. Skip this place. Hotel was a great location, but scary people hung around. The cops showed up nightly due to colorful characters. The room was a cheap price and close to everything, so not all bad. Good for a solo business trip. What you would expect for the price. Nice location. I was able to walk to a lake and to a restaurant downtown. You get what you pay. Great location in downtown Orlando, but rooms were not cleaned before we arrived. Staff was friendly and helpful. The hotel has 2 stories and I didn't see an elevator. It was not a problem for me, but the elderly may have a problem. Room was clean. There was a coffee maker in the room, but no carafe or coffee. I was there to help my son move into one of the downtown condos, so, the location was perfect. I will be returning to Orlando to visit him and I will definitely stay there again. Well the great thing is the location. My friend and I went out to the bars for my birthday celebration. We took a cab and it cost us $5, the bars are walking distance but we were girly girl in heels. When we checked in at 830p, I believe Bob was at front desk, he's great. After getting back from the clubs the front desk young lady was a nightmare. Very rude! We asked for another parking pass and we couldn't get on because of their lack of parking. She called the police on us because she said we were giving her "attitude" and yelling at her. So my all about me birthday ended pretty horribly. Don't expect anything nice, but it's perfect if you're just looking for somewhere to sleep and leave your things in downtown Orlando. Price is good, but don't expect anything nice or fancy. Located in Downtown Orlando within a 5-minute walk of Lake Eola Park, Travelodge by Wyndham Orlando Downtown Centroplex is within a mile (2 km) of other popular attractions like Amway Center. This 73-room motel welcomes guests with a restaurant and conveniences like an outdoor pool and free in-room WiFi. For your convenience, breakfast is available for a fee. The onsite restaurant is perfect for a quick bite to eat. A flat-screen TV comes with cable channels, and guests can stay connected with free WiFi. The bathroom offers hair dryers and free toiletries. 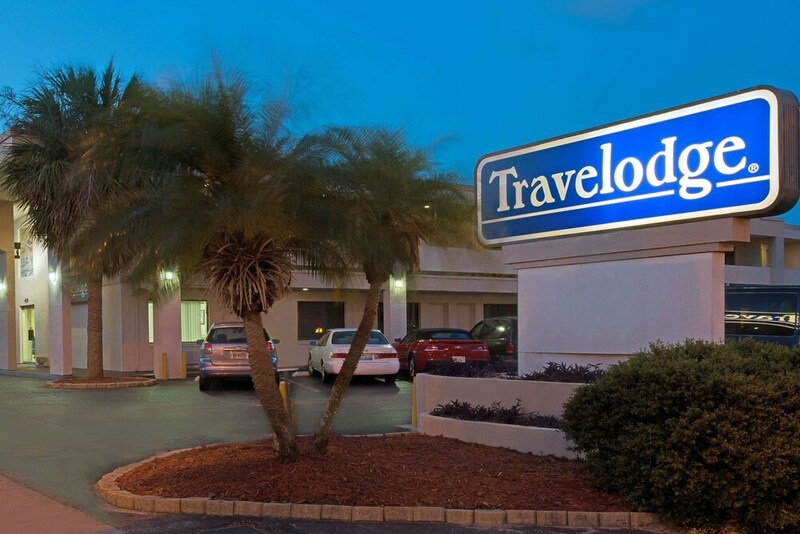 An outdoor pool and free WiFi in public areas are features at Travelodge by Wyndham Orlando Downtown Centroplex. Free parking is available if you drive. The 24-hour front desk has staff always at the ready. Recreation features at Travelodge by Wyndham Orlando Downtown Centroplex include an outdoor pool.